British made shaving products…You’ll find many great British saving products listed below (as usual in no particular order). Now that Gillette and Wilkinson Sword make their razors abroad a good alternative is a King of Shaves razor. Their Azor razor (pictured below) is very lightweight (great for travel). It takes a bit of getting used to if you usually use say a Mach 3 and you need to press a bit harder but it gives a good shave and is almost impossible to cut yourself with. The razor and the blades tend to be ever so slightly cheaper than Gillette too. King of Shaves razors are designed, assembled and packed in the UK (I think the blades are Japanese), so this is a bit of a compromise. I don’t think there are any totally UK made razors anymore. That said King of Shaves tell me that their handles are designed & manufactured in UK too, in Chesham, Bucks and the last razor I bought from King of Shaves says made in the UK on the packaging. Good to know. These are very good razors. As of May 2017 the Azors 4 and 5 have now been discontinued, with the Hyperglide to follow soon. The KOS5 is the replacement for the Hyperglide with an Azor replacement due. I was at a loss to see why King of Shaves would discontinue the Azors razor as this gave the best shave of any modern razor and it was British made. Looking at their website today (6 August 2017) I can now see they have sadly moved production abroad. The Retro 4, which I guess replaces the Azors, “Handle made in Mexico. Blades made in Greece” and the KOS 5-Blade, which replaced the hyperglide, “Blades made in USA and Germany. Assembled in China”. They are now a standard razor head rather than the rather unique King of Shaves Azor deign. The decision to move manufacturing abroad appears to be related to difficulties with their Japanese blade supplier. At least country of origin for these new razors is clearly stated. My main reason for choosing King of Shaves above any other modern razor was that they were British made. Such as shame to see that they are now foreign made. What a big disappointment. The company have told me that their “skincare & shave preps are UK developed, sourced & manufactured” still. King of Shaves Azor razor. Made in the UK – now discontinued and King of Shave razors are now foreign made. 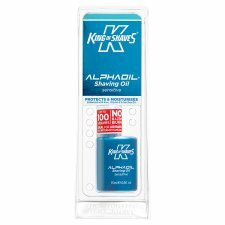 King of Shaves Alphaoil Shaving Oil. Made in the United Kingdom. 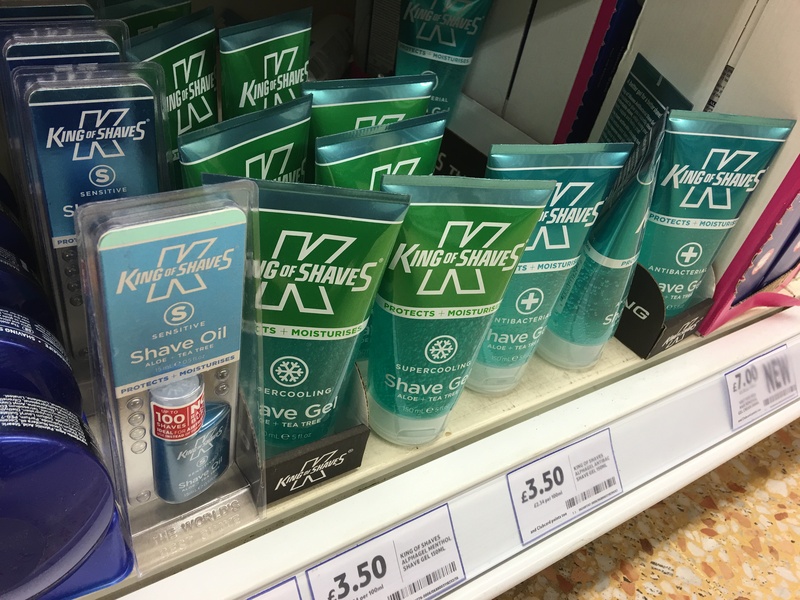 King of Shaves Shave Oil and King of Shaves Shave Gels – made in the UK. Photographed by author in Tesco Flitwick 12/2/16. This entry was posted in Health and Beauty, Men's Grooming, Razors, Shaving and Beard Care, Taylor of Old Bond Street and tagged Abbeyhorn, Alexander Simpson, assembled in the UK, Avaj, Barbers, Beardbase, Beaufort London, Beauty@Creightons, Bedfordshire Beard Co, Bolin Webb Razors, Bonds of London, Bounder Extra Firm moustache wax, British Beards, Bulldog, Captain Fawcett's, Creightons, Culmak, Cut Throat Razors, Cyril R. Salter, D R Harris, Denman, Double Edge Safety Razors, Duralon, Edwin Jagger, Ernest Wright and Son Limited, Fat Jacks Tash Wax, First Olympian Beard Oils, Floris, Gillette, Hair Care, Handlebar Moustaches, Harrow and Penny, Honest Skincare, Hughes Tash Wax, Jack Dean, Kent Brushes, King Of Shaves, Lush, Made in Engand, ManCave, Men's Grooming, mens grooming products, Mitchell's Wool Fat Soap, Mo Bro's, Modern Blade Razors, Moustache Wax, Moustache Wax Made in the UK, Moustaches, Movember, Movember moustache wax, Mr King's Marvellous Moustache Wax, MR NATTY'S MOUSTACHE WAX, Murdock, Murdock London, Murdock's Marvellous Moustache Wax, Mustache Wax, My Moustache Cup, Nanny's Silly Soap, Neal's Yard, New Forest Shaving Brushes, Norse, Ockham, Penhaligon's, Pooley Sword, Potter and Moore, Progress (Vulfix) Limited, Razor strops, razors, Rhino Skin Armour, Rockface, Roo's, Rooney, Scottish Fine Soaps Company, Scotweb, Scoundrel's, Shavers, shaving, Shaving Brushes, shaving cream, Simpsons, St James of London, Straight Razors, Strop Shop, Taylor of Old Bond Street, Tesco, The Dandy Gent, The Gentle-Man Range, The Gentleman's Shop, The Handlebar Club, The Murdock Moustache Comb, The Sheffield Skin Company, Thomas Clipper, Tony's Barber Shop Wonderful Moustache Wax, Trestle Shop, Truefitt and Hill, Trumper, UK Made Shaving, ukmade is on Twitter, Vilfix, Waitrose Pure, Whitlock Wooden Designs, Wilkinson Sword on September 24, 2012 by ukmade.